Description - Bach is 29 years old, Asian appearance, 167cm tall, with a medium build and olive complexion, brown hair and brown eyes. He was last seen wearing dark blue or black denim jeans, a white denim-style jacket and black thongs. 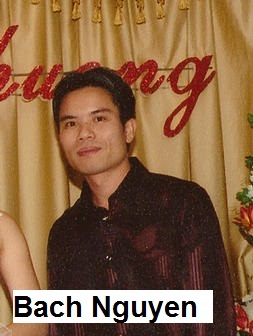 Circumstances - Bach Nguyen was last seen leaving his sister's Waterloo, NSW home on Sunday, May 18th 2008. Grave fears are held for his safety and welfare. Bach's Toyota Rav4 (registration VQN 888) was found by police abandoned in Melia Way, Macquarie Fields the day after he was reported missing by his family. Asian Crime Squad detectives are investigating the disappearance of a Vietnamese man who has not been seen or heard from since mid-May. Bach Quyen Nguyen, aged 29, was last seen leaving his sister's home in Waterloo on the evening of Sunday 18 May. He did not return home that night and his sister reported him missing at Marrickville Police Station three days later, on Wednesday 21 May. The day after he was reported missing, Mr Nguyen's Toyota Rav4 (registration VQN 888) was found by police abandoned in Melia Way, Macquarie Fields, and seized for forensic examination. Family have described his disappearance as out-of-character and there are grave concerns for his welfare. He has not accessed his bank accounts since the day he was last seen. He has been living in Sydney for almost eight years and is an Australian Citizen, who runs a money transfer business. Mr Nguyen has been described to police as being of Asian appearance, 167cm tall, with a medium build and olive complexion, brown hair and brown eyes. He was last seen wearing dark blue or black denim jeans, a white denim-style jacket and black thongs. Mr Nguyen's disappearance is being treated as suspicious and Strike Force Monara has been established by the Asian Crime Squad to carry out inquiries. Detectives are keen to hear from any members of the public who might have seen Mr Nguyen's vehicle prior to its discovery in Macquarie Fields. Investigators are also urging any of Mr Nguyen's friends, acquaintances or associates who have heard from him since his disappearance to contact the strike force as soon as possible. Inquiries into Mr Nguyen's disappearance are continuing and members of the public who have seen or heard from him are urged to contact police via Crime Stoppers on 1800 333 000. Information can be provided anonymously and will be treated in the strictest confidence.